Reader Success! $14,000 Worth of Travel &amp; 800,000 Miles Earned in Just 2 Years! Anthony is our newest reader success story to show folks it’s possible to travel without spending a lot of money. If you would like to be inspired by more stories like this one, take a second to subscribe to our newsletter! 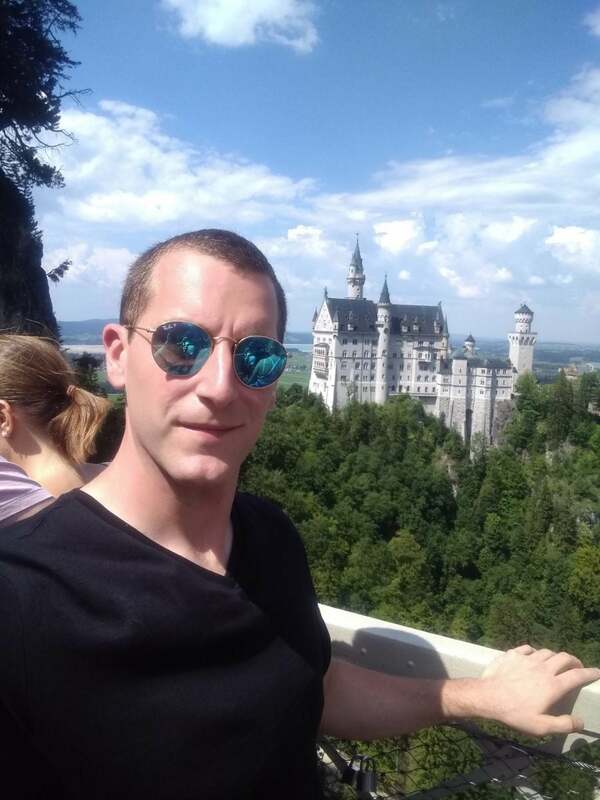 Here’s Reader Anthony at Neuschwanstein Castle. Seeing This Castle on Instagram Was What Sparked Anthony’s Interest in Taking This Vacation! My name is Anthony, and I have documented many of my travel adventures through my Instagram account! I have been involved in the miles & points hobby for about 2 years. It all started when I applied for the Chase Sapphire Reserve®, which at the time had an intro bonus of 100,000 Chase Ultimate Rewards points at the time (no longer available). After I earned the huge welcome bonus, I used the points to take a trip to London. Since then I have fully committed to the miles and points hobby, and have earned over 800,000 miles across 9 different rewards programs. The goal of the trip was to take at least a 2 week vacation in Europe without any out-of-pocket costs for airfare or hotels. I was flying out from Boston and wanted to book a Business Class award flight, and stay only in 4 and 5 star hotels. I called it my “#pointscation”! I ended up flying to Stockholm, Berlin, Vienna, Munich, and Zurich. 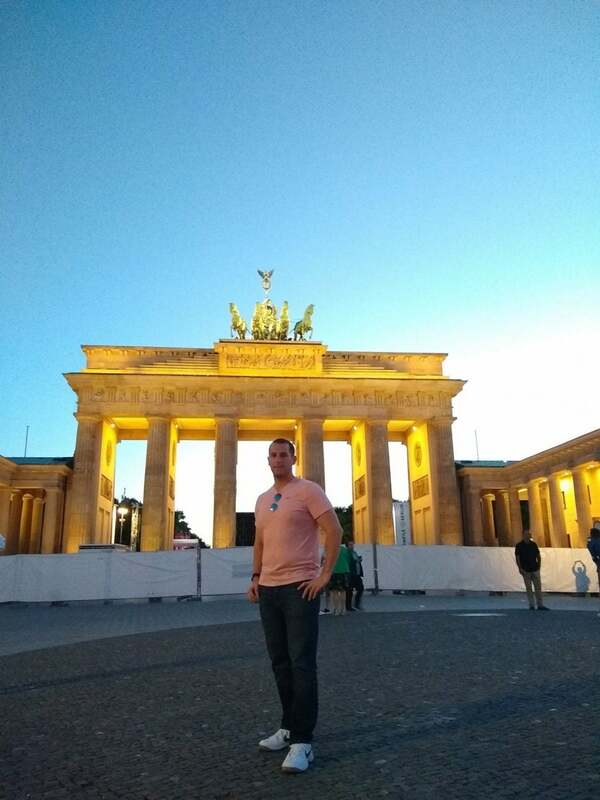 Reader Anthony Visited Brandenburg Gate in Berlin! It took me about 1 year to earn the points needed for this trip. In formulating my strategy as to which credit cards to apply for, I had to be mindful of certain bank’s application policies, such as Chase’s 5/24 rule. I also found it very helpful to target cards that had huge intro bonuses. Because earning those bonuses really went a long way in helping me achieve my goal of booking this vacation to Europe without any out-of-pocket costs. I’m also in graduate school part-time, and I found it helpful to be able to pay for things like books and tuition with credit cards because it helped me meet minimum spending requirements to earn the welcome bonuses. I ended up redeeming points from quite a few different programs, including Hyatt, United Airlines, Starwood, IHG, and Chase. Almost all of the miles and points I redeemed were earned through regular daily purchases and intro bonuses, although I did purchase about 20,000 Starwood points during one of their sales. I ended up paying about $2,000 out-of-pocket for things like food and other fun activities. But without miles and points to pay for things like my flights and hotel stays, the same trip would have cost over $16,000! 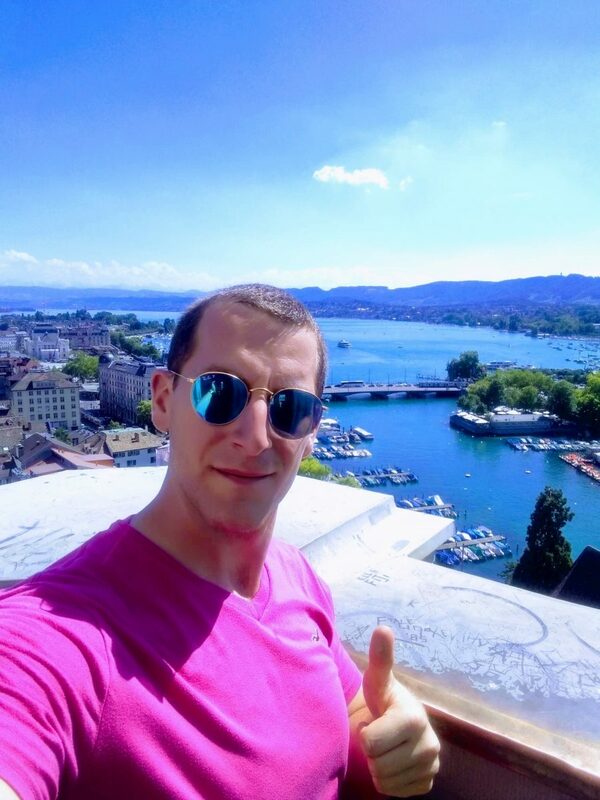 On Top of the Grossmunster Overlooking Zurich. This Is the Best View and Also a Great Way to Appreciate the Beauty of Lake Zurich! First, I had to figure out the best routes to and from Boston. I used flightconnections.com in my planning phase to get an idea of the available routes, and then ultimately found the award flights I wanted through the United Airlines website. I flew Lufthansa to Stockholm in the upper deck of a 747 on 1 leg of the trip, which had always been a childhood dream of mine. And fortunately, not many of the seats were booked so I had plenty of legroom. On my flight back to Boston, I booked an award flight on Swiss Air and was able to snag a Throne seat without paying the usual ~$150 to $200 fee. I didn’t have much trouble finding hotels. I basically just looked in the center of the city I’d be visiting, and worked my way outwards until I found a hotel from one of the large hotel chains. For example, I stayed at the Hotel Bristol in Vienna for 48,000 Starwood points, and also took advantage of the 5th night free perk. And in Berlin, I stayed at the Grand Hyatt Berlin, my favorite hotel in the entire trip! Finding award stays for a hotel in Stockholm was the most difficult. Fortunately, I had earned a lot of Chase Ultimate Rewards points and was able to book The King’s Garden Hotel for 10,000 Chase Ultimate Rewards points per night. 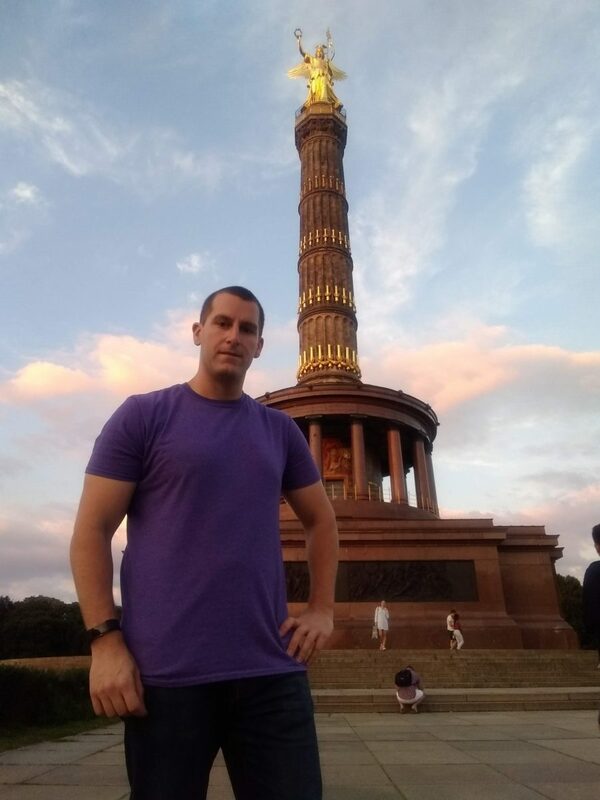 Anthony Visited the Victory Column in Berlin! As a History Buff, This Was a Special Experience! Be forewarned! This was my first time in all of these cities and I basically went full tourist mode! But if you do go, I’d recommend the following places. 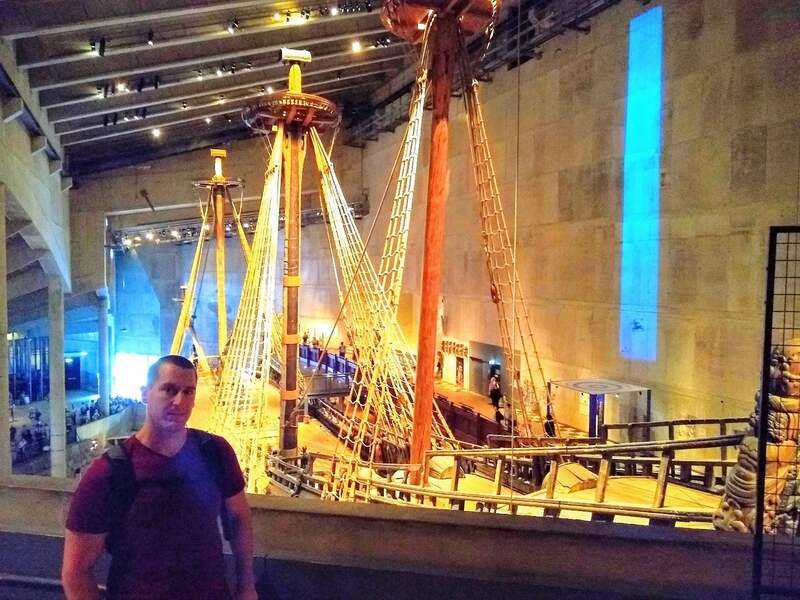 Visit the Vasa Museum when it first opens, before the lines get too long! Also, just spend a night drinking and eating on the Strandvägen. It’s basically a stretch of land on the water lined with restaurants, bars, and piers to drink and relax on. Do a day trip to Salzburg. It was one of the most beautiful places I’ve seen! If you decide to do this, I’d recommend spending 3 days in Vienna, then take the train to Salzburg, and then continue on to Munich if you like. I made a mistake in my itinerary, but believe that would be the most efficient way of traveling if you plan on visiting those places. Do a day trip to Neuschwanstein Castle. I booked a tour through Gray Line Tours! I also kept a record of my itinerary on my Instagram account,@tontravels. All of my activities were logged and saved to my page in the stories section. You can also see my pictures from this vacation under my unique hashtag, #pointscation! I learned that it can really help to be organized! I usually wing it on many activities, but for a more complex task like this vacation, it really helped to be organized with tools like Google Calendar for instance. And I conquered my fear of traveling alone and still managed to have tons of fun! Basically, I’ve learned that if I keep waiting for others, I may never get to experience the world. It was a sentiment I kept talking about with random strangers in bars and lines. So get out there and explore! Make sure that the points you earn are in the right programs that you’ll be able to use for your trips. After all, it’s no good if you have a lot of miles and points in programs you won’t use! So you want to plan ahead and do some research to make sure you’ll be able to book certain hotels where you’ll be traveling for instance. I often have friends and family asking me which credit cards they should get, and I always tell them it depends on where they want to travel and which hotels they’ll want to stay in! It’s important to understand the importance and value that even a little bit of research and planning can have because that’s the best way to make the most of your hard-earned points!